Skakwal - (Lamprey Eel) - A plywood replica of a Chinook canoe. This canoe was made in 2003 for the Chinook Tribe. He is named after the Lamprey Eel because the Lamprey can swim anywhere, even right up the side of a waterfall. This name was given with the hope that this canoe could swim into dangerous waters and always bring the crew home safely. The gender of a tribal canoe depends on the gender of whoever the canoe was named after. This was the next step up in size of canoe. Skakwal is only three feet longer than Ul Iymist but this results in a significant increase in capacity, stability and power. 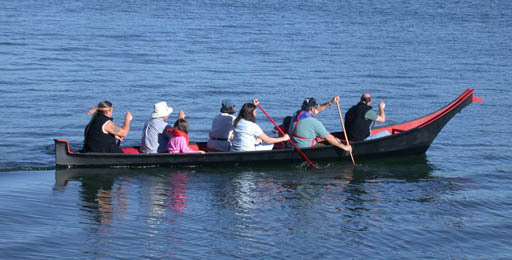 The Chinook Canoe Family has taken Skakwal on annual Paddle Journeys for many years now. He has also been taken out to meet the Tall Ships Lady Washington and Hawaiian Princess for trading. Three canoes on the Columbia River after the after their naming ceremony at Ft Clatsop.